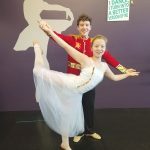 Capture the magic of the holiday season with Oregon Coast Dance Center’s 12th annual, “The Nutcracker”. Performances will be held Friday December 14th at 7:00 pm and Saturday December 15th at 2:00 pm, in the Tillamook High School Don Whitney Auditorium. Local dancers from ages 3 – 65 will perform in this wonderful, family-friendly Christmas tradition. “The Nutcracker’s” magical story follows a young girl who falls asleep after a Christmas Eve party at her house. As she sleeps, she dreams herself into a fantastical world where her beloved Nutcracker comes to life and defends her from the Mouse King. The Nutcracker Prince takes her to the Kingdom of Sweets where she is greeted by the Sugar Plum Fairy and characters from different countries, who all perform for her. At the end of the night, she wakes up, back at her house, and wonders if it was real…or just a dream? These performances serve as a fundraiser for Oregon Coast Dance Center’s not-for-profit Performance Group. Admission is $5/person at the door, doors open at 6:30 pm on Friday December 14th and 1:30 pm on Saturday December 15th. Oregon Coast Dance Center has been offering dance and performing arts in Tillamook County since 1975, with locations in Tillamook and Nehalem. For more information visit www.oregoncoastdancecenter.com or call 503-842-7447.